There is a lot of talk about testing foods, but how do you get to an intake of foods that you can feel are safe to test from? If you are very sensitive it is hard! You are right it is about threshold. That reminds you of the great cartoon of a person feeling “fragile” and another feeling “robust” at the beginning of Chapter 3 in Tolerating Troublesome Foods: “Tolerance can change for many reasons”. This book can be a great support to you as you work out what matters to you. All the environmental factors that affect your asthma affect your tolerance of food. This is the “shift” some mention. It is a good word as these changes can make you feel “off balance” from foods you thought you were tolerating well enough. After your initial trial you begin by having some foods that really clarify that you are indeed sensitive to salicylates – perhaps using apples, additives – perhaps using some liked icy-poles in summer; amines – perhaps using chocolate or ripe bananas, and sulphites for your asthma. The problem is that in each of these groups there is individual variation in what you get away with. So then you begin what we could call the “finer point” challenges of the various groups. You may begin with testing low salicylate veges or fruit. The book: Tolerating Troublesome Foods becomes your main guide as you note all the “careful testing” hints for testing just the foods you most want to return to your diet http://www.foodintolerancepro.com/tolerating-troublesome-foods/ .You may tolerate many foods or be one of the very sensitive people. You see how much you can get away with but also develop an idea of the minimum amount you will go back to when you need to be careful of for some reason. 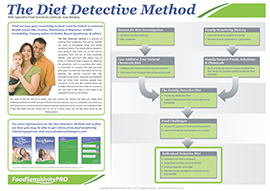 Of course you should have the support of a dietitian to help you with a diet you need for life. Make sure you attend all appointments until you feel you are coping well. It does probably take nearly a year to get to the stage where you have a careful baseline diet. Even if you are very sensitive your baseline diet could include, perhaps, a trace of milk in your weak decaf coffee, a taste of wheat in a mild homemade gravy, carrots only when they are sweet, a bite of watermelon or honey-dew melon, only just ripe bananas [and only half a banana a day], and no additives. You will discover which of your main food chemical groups are least severe in causing reactions in you as an individual. At this time you give yourself a few days until your feel you are coping with the “shift”. Then it is important you read Tolerating Troublesome Foods and think about what foods are the most important to test. You want to avoid the muddle where you alternate between feeling you have to go back to your original strict diet, and coping with fairly bad reactions to life happenings, such as having to eat away from home, or where you felt you had to go bust from your diet. It isn’t easy but as you keep testing low risk foods, you do get a feel for what your body is telling you: that you can have small amounts of various foods in your baseline diet, so over time your baseline diet is getting broader.